Work continues to happen at the museum in preparation for the coming season. This week, work continued on 917-D, getting closer to being ready for re-entry into the RAL program. Greg Elems is shown below working on rust removal on the nose of 917, in preparation for temporary repairs to prevent further rust damage. Removal of peeling paint is revealing an interesting history of patches and repairs on 917. This weekend was also the first crew training session for the 2014 operating season. We welcomed several new volunteers, and had a good turnout. The next opportunities for crew training will be April 26 and 27, at 9am. The Museum wood shop has also been cleaned out, and organized thanks to the efforts of Eugene and Tom Carter. 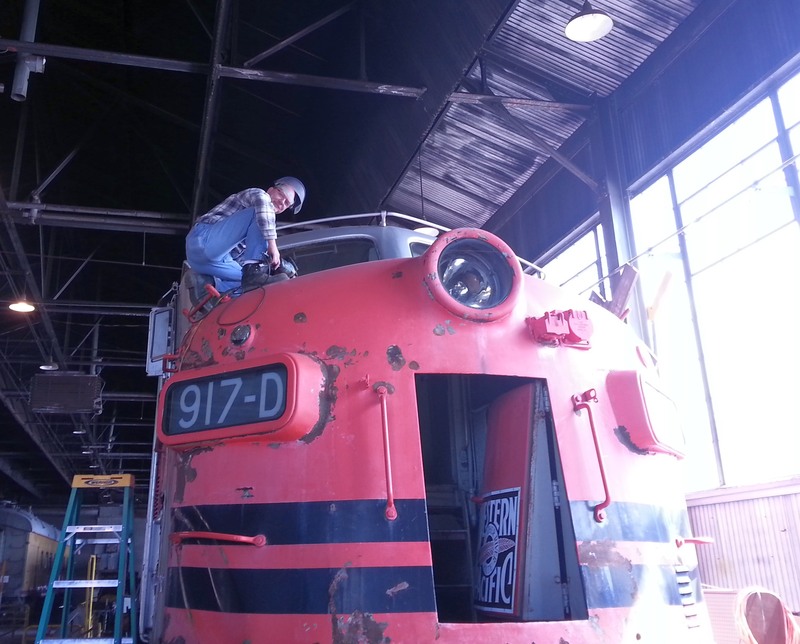 Greg Elems works on 917 in preparation for rust prevention work.